"I see the moon and the moon sees me, down through the leaves of an old oak tree..."
What can I say? I could wax poetic on this woman's work for... ever! 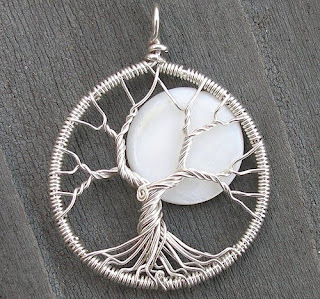 She makes the most unusual and unique Tree of Life pendants and jewelry that I've ever seen. Each piece is made of reclaimed silver and other than my absolute favorite (I have a thing for that moon in the barren branches!) with vibrant and beautiful gemstones. Each one is a celebration of the interconnectedness of all life on our planet and a beautiful, wearable demonstration of your admiration and love for life and mother nature. She even has a tutorial on how you can make your own! Now, if the Tree of Life design isn't your thing? 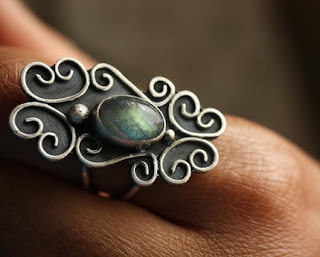 Don't worry, Ethora's shop is still definitely worth a browse because not only does Ethora make Tree of Life pendants; she also has some beautiful gemstone rings and earrings as well. And get this! Not only is each piece she crafts unique, meaningful and durable, they all come with an unconditional lifetime guarantee for as long as she's alive! So take a look. If you're like me, wandering through her shop won't be just a wonderful browsing and shopping experience but a wonderful experience all the way around! There's just something about Ethora that makes the vibe in her shop reach out and touch on the need for some serenity in all of us! TO VISIT ETHORA'S SHOP YOU CAN CLICK THE PICTURE ABOVE OR, IF YOU RATHER, CLICK RIGHT HERE! That's what I stumbled across in my browsing the other day. Beautiful paintings ranging from large murals your walls to tiny miniatures you wear! Pastel Originals doesn't just sell hand painted pendants like I have pictured here, but you can really see the detail and craftsmanship in those in particular! The pendant pictured here is only about an inch-and-a-half in size and yet the detail is clear, sharp and beautiful! 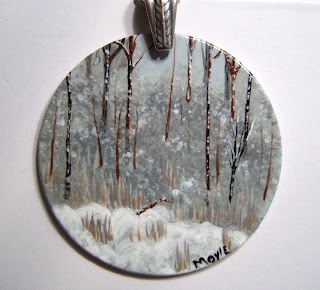 And she doesn't just paint on pendants either! In her shop you can find Mini-Art painted on thread spools and full size paintings ranging in size from 5x7 to 18x24 and even a few that are even larger! "When you purchase an item from my shop, your not just getting a one of a kind original painting. Your getting your very own quiet peaceful place full of fresh air and the sounds of running water and birds in the trees. The memory of children laughing in the distance. This is where the stress of your day can melt away. Here in the memories of a happy yesterday." For anyone looking for a taste of that sweet bliss described above, whether for a gift to another, a spot on your wall at home or even to wear, this is one place you shouldn't miss out on browsing through. YOU CAN CLICK ON THE PICTURE ABOVE TO VISIT PASTELORIGINALS' ETSY SHOP OR, IF YOU PREFER, CLICK RIGHT HERE. Like many women out there, I have a "thing" for shoes. I love shoes and have tons and tons of them. At the same time? I can never have too many. There's always another pair just around the corner waiting with my name on it. Because of this, Scholarly Articles is one of those shops where I could spend hours! Why? Because she sells SHOES. 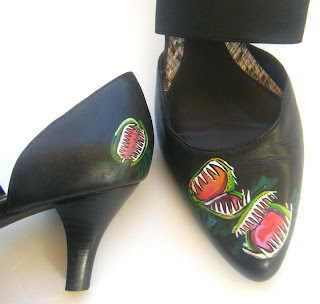 She hand-paints all of her shoes and handbags with professional-quality leather paint and then seal them with an acrylic leather sealer. This process allows the painted leather to stretch and bend without damaging the artwork depicted on it. Not only that, but all bags and most of the shoes are vintage, with a few newer shoes thrown-in for women with feet that do not fit into vintage. And she welcomes custom requests as well! If you're looking for the perfect gift for someone who appreciates one-of-a-kind wearable art or eco-conscious fashion, you should definitely check out Scholarly Articles! For that matter, if you love shoes or handbags? The same applies! TO VISIT SCHOLARLYARTICLES' SHOP YOU CAN CLICK THE PICTURE ABOVE OR, IF YOU RATHER, CLICK RIGHT HERE! I love to browse through Craft Gawker (and Food Gawker, for that matter! ), and I just recently had one of my own photographs featured on their site yesterday. It's a great site with wonderful eye candy to browse through, and it's how I discovered this truly unique and talented duo. 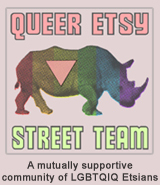 Veronica and Isaac run the Book of Art shop on Etsy and their products are like nothing I've ever seen before. 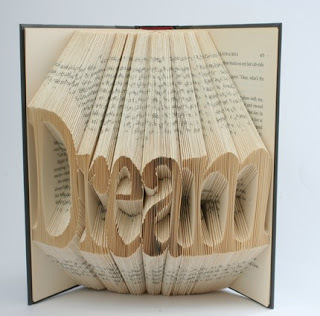 They take books, all different kinds of books, and turn them into beautiful 3D art by folding the interior pages. Kind of like full-book origami. In this case, it's hard to describe but the results are truly eye-catching and a picture is definitely worth a few thousand words! Just take a look at the picture to the left to see what I mean. Isaac is the artist who creates these amazing pieces of art and his wife Veronica runs their shop on Etsy. If you really want a truly unique gift to amaze the book lovers and readers in your life, I'd definitely recommend checking Book of Arts out! YOU CAN CLICK ON THE PICTURE ABOVE TO VISIT BOOKOFARTS' ETSY SHOP OR, IF YOU PREFER, CLICK RIGHT HERE.